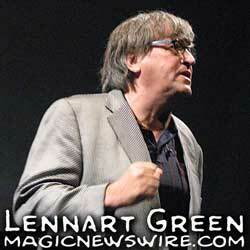 Swedish card maestro Lennart Green has been baffling audiences for years with his chaotic style of magic. In 1991 he won the grand prize in close-up card magic from the International Federation of Magic Societies (FISM). He almost won at FISM in 1988 except for the fact that his act so fooled the judges that they were convinced that he had used stooges and disqualified him. His magic has taken him around the world and even led to his appearance on NBC's The World's Greatest Magic. I recently had the opportunity to meet Lennart when he was in Atlanta for the "Gathering for Gardner" and we discuss his interest in this unique conference as well as his passion for our art on this episode of the Spirit of Magic podcast.